Set in 17th-century Spain and narrated with hypnotic intensity, Poison is the story of two women, born on the same day, whose lives run a parallel, tragic course. The terror of Spain’s Inquisition, the tyranny of superstition, the rapture of religious fervor and the intrigue of the king’s court form the backdrop of this rich, mesmerizing novel. Francisca de Luarca is the daughter of a poor Castilian silk farmer and shares his passionate determination and imagination. Forbidden by Spanish law to wear the silk her family makes, she dreams of the splendid silk garments woven for kings and queens, even as she fantasizes of learning to read the writing of the saints and becoming like the angels. At the same time, the lovely, naive Marie Louise de Bourbon dances in silk slippers in the Parisian palace of her uncle, King Louis XIV, and imagines her own enchanted future. It is in Madrid that the lives of these two young women unfold in tandem, almost touching. Each hoards the memory of her adored lost mother like an amulet. Forced to marry the impotent King Carlos II of Spain, Marie Louise pays dearly for her failure to produce an heir to the throne. And in the tunnels below the city streets, where the hooded torturers of the Grand Inquisitor exact confessions from suspected witches and heretics, Francisca learns the terrible consequences of her obsession with a Catholic priest, the man who teaches her to read and to love. In 1679 Marie Louise de Bourbon, the niece of Louis XIV, the Sun King, married Carlos II, the last of the Spanish Hapsburgs, in the village of Quintanapalla, Spain. She and Carlos were both 18. The princess was tall, beautiful and vivacious, fond of frolics and horseback riding; the king was short, ugly and gloomy, given to paranoia and superstitions and so many everlasting illnesses that he confined his food to bowls of breast milk supplied by a platoon of healthy wet nurses. “Poison” is a fantasy on the Queen’s life and death told by the fictional Francisca Luarca, the daughter of a failed Castilian silk grower, as she is held in an underground prison during the Inquisition. King Carlos had made an official statement from the royal balcony in the Plaza Mayor: ” ‘The failure of Queen Maria Luisa to get with child,’ he said, ‘is due to sorcery.’ ” Within a day 17 witches were found in the royal residence, and all persons who’d been employed in the palace from the year of Carlos’s birth until the present were investigated. Since Francisca’s gracious and bountiful mother had been one of the child king’s wet nurses and was now dead, the Luarca family fell under great suspicion and the Inquisition found out that Francisca often wandered far afield, which was at best unseemly, that she’d been taught to read for some possibly nefarious purpose and that her teacher was a faithless priest, Alvaro Gajardo, by whom she was pregnant and with whom she was obsessively in love. Either she was a witch, then, or a fool. Kathryn Harrison’s “Thicker Than Water” (1991) and “Exposure” (1993) were harrowing contemporary novels, so it’s gratifying to find that in this book she’s handled the forbidding obligations of historical fiction so well. Harrison acknowledges guidance in her research from such institutions as the Hispanic Society of America, the National Health Museum, the Prado and the Textile Museum Library, and none of that good learning has gone to waste. She gives elegant lessons in how silk is made, how human anatomy was fleetingly taught in the age of chirurgeons, how the aristocracy so sought loftiness that they often stood on stilts, how stinging blister beetles are ground into cantharidian powder, a poison whose tincture is known as Spanish fly. “Poison” is a fascinating, feminist princess-and-pauper story, gorgeously written and hauntingly told. It is a tale of passion, hopelessness and thwarted ambitions in a harsh and hate-filled century that was, as in all fine historical fiction, quite different than and disturbingly like our own. Fans of Kathryn Harrison’s last novel, “Exposure,” a psychological study as up-to-date as the chilling Metropolitan section of the daily paper, may be surprised by “Poison.” Harrison has moved backward in time, some 300 years. “Poison” takes place in late 17th Century Spain. Long past its Golden Age, the country is in economic and political decline; the Venetian ambassador writes home in 1690 that Spain is “a series of unending calamities.” On the throne sits Charles II, the infantile, physically and mentally damaged consequence of constant Hapsburg intermarriage. He would die childless at 35, the last of the Spanish Hapsburgs. Relentless ethnic cleansing is taking place, 300 years since the first Grand Inquisitor, Tomas de Torquemada, persuaded their Majesties, Fernando and Isabella, that state security demanded the expulsion or conversion of Spain’s Jews. The Inquisition, which had faded in other parts of Europe, was still rooting out lapsed Murranos, Moriscos, Moors, witches. Denounced people disappeared into the Inquisition’s prisons, their shoes left behind as a sign. Harrison is fascinated by doubles, by mirror images. In “Exposure” she probed the space between a woman’s public and private histories. Here she gives us two women, one high, one low. One has a rapturous, forbidden love affair with a priest, the other lives in a world parched of human sympathy. Both are crushed by the anxiety, corruption and religious fanaticism that hang like a miasma over the country. Francisca de Luarca is the daughter of a Castilian family of silk-worm farmers. Having little to begin with, they lose it all when Felix, the father, gambles on a new type of mulberry tree. When the leaves mature they are inedible; his silkworms starve. His wife, who pregnant or not overflows with milk, becomes a wet nurse. Eventually she attracts the attention of the palace, is brought there to suckle the sickly 7-year-old king whose lifelong diet will be bread sopped in breast milk. When she finally comes home it is to die, depleted and exhausted, of tuberculosis. At her deathbed is Alvaro, the thoughtful village priest. He fascinates Francisca, agrees after a time to teach her to read, as her mother learned to at court. Liberating her soul this way has dire consequences. He becomes the Paolo to her Francesca (Harrison is careful with names), and as in Dante, the day comes when they read no more. Once at the Morgan Library in New York I saw a display of private love letters of some of the world’s greatest writers. For the most part they were as flat and trite as any declaration of the inarticulate Christian de Neuvillette in the play “Cyrano de Bergerac.” Love, always a bright surprise to lovers, can be as interesting as a retreaded tire to readers. 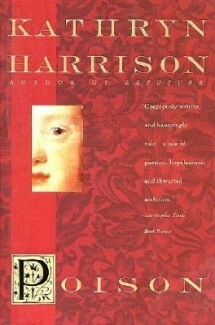 So Harrison’s take is all the more remarkable–crystalline prose perfumed (but not too much; she knows just when to stop) with musky eroticism, bigger enough than life to carry you away. In a book full of memorable passages the love scenes of Alvaro and Francisca stand out. Inevitably the pair grows careless. They are denounced, swept up by the Inquisition. Alvaro is put to death, Francisca made to wear the Sanbenito, Spain’s scarlet letter, a yellow overgarment. Embroidered on the front in scarlet stitches are a quill and scroll representing Letters and a breasted serpent representing Lust; on the back an image of the devil pitchforking a woman into the Eternal Flames. Eventually the Inquisitors come for her, intending to torture out of her a confession that she and her dead mother are witches responsible for the fact that, in the palace, the queen is barren. The unhappy queen is Maria Luisa, once Marie Louise of France, the niece of le Roi Soleil, Louis XIV. Raised in the splendors of Versailles, she is married at 18 to the adolescent king. The alliance is political; her only purpose is to breed another Spanish king. Although her husband is as impotent as he is repulsive, it is the queen who is called barren. The court tries everything–holy relics, the most modern medical attention–but it all fails. In her panic she feigns pregnancies and miscarriages with the help of accomplices and a few liters of pig’s blood. Like Francisca, she is found out; poisoned, she is dead at 28, a sacrifice to the exigencies of the Crown. If Harrison writes meltingly about sexual love, she does even better at sexual loathing of the hold-your-nose, close-your-eyes variety, and the mixture of disgust, longing, pity and duty in the couplings of Charles and Maria Luisa. Where “Poison” is weakest is, appropriately enough, the mirror image of where it is strongest. The writing is not so much written as embroidered on the page (fittingly, since it is silk that threads the book together). As a result the characters sometimes freeze into figures in a tapestry, vivid in their way but often seeming posed, overly stylized. Perhaps this is what Harrison intended, to reproduce the unreal, nearly hallucinatory quality of the period. Yet it can distance the reader from a continuing sense that the characters are solid and alive. Flaubert once marveled at how long it took him to shake off the smell of arsenic after writing Madame Bovary’s death scene. Readers of “Poison” may feel the same. 1. Sexuality, religion and literacy are linked strongly throughout Poison. Francisca says, “Venite ad me. Alvaro spoke to me in Latin, the language of the Church and all her saints, and when he called me to him with those words our union existed not only out of time but beyond ordinary and profane human conversation as well. We became sacred together.” (p. 179) Why do Alvaro’s words have such power to seduce Francisca? What does she mean by saying, “I was never sure which Alvaro I wanted, angel or mortal?” (p. 183) In what ways does her obsession with the lives of Saint Teresa of Avila and the martyrs make her so vulnerable to Alvaro? How is she able to maintain the belief that their love is sacred despite its clear defiance of social propriety and Church law? 2. The connection between literacy and witchcraft also pervades the novel. Why are the citizens in Francisca’s region so superstitious and fearful of those who can read? Why do the Inquisitors seek to punish the literate even when they read books written by the holy people of the Church? Why is Francisca’s affair with Alvaro considered so dangerous to the social order? 3. The countries of Spain and France are continually compared and contrasted in the text. Francisca says, “I am my father’s daughter. I am a daughter of the Castile,” (p. 26) land of Don Quixote, “a somber, guilty kingdom.” (p. 236) Marie Louise is a child of Parisian splendor, accustomed to a life filled with fragrant flowers and “endless dizzy balls.” (p. 47) How do the geographic backgrounds of these women help shape their characters? How do they lead to their downfalls? 4. The name “Francisca” means “the free one.” (p. 185) In what ways is this true? In what ways ironic? 5. Francisca says at the novel’s opening that her mother represents “a taste of something of which I never have my fill.” (p. 27) Both Francisca and Marie Louise share extraordinarily strong bonds with their mothers. How do these relationships sustain them throughout their lives? How do they contribute to and, early in the novel, foreshadow the disastrous events that befall them? How does Alvaro’s presence at-Concepcion’s death act as a catalyst to his relationship with Francisca? 6. The relationship between Francisca and her sister Dolores is portrayed as deeply disturbed. To what extent is this attributable to their personality differences? To their attachments to their parents? Which is the stronger motivation for Dolores’s treacherous act of betraying Francisca: jealousy or fear? Of the two sisters, who has the unhappier life, in your estimation? 7. At the wedding of Marie Louise to Carlos, both she and Francisca wear distinctive clothing: a smock of shame for Francisca and a “gown of misery” covering Marie Louise’s bridal splendor. (pp. 50-51) What does the imposition of these garments upon the two women reveal about society’s expectations for and fear of them? How do they foreshadow what each woman will wear at the novel’s conclusion? 8. Silk production is a leitmotif of the novel that illuminates the characters and becomes a metaphor for the transformations each major character undergoes. What does Francisca mean when she says, “I am a silkworm,” as she is being tortured in the tunnels? (pp. 115-117) How is her expected “martyrdom” and transcendence symbolized by the lives of silkworms? In what ways does the course of Francisca’s questioning by the Inquisition, “the wash works,” (p. 114) parallel the centuries old enslavement of the silkworm? What is the significance of Francisca meeting her lover in the silk house? 9. The color white appears as a frequent symbol. It is both the color of Francisca’s torturers’ hoods and the color, at Marie Louise’s death, of “innocence restored.” (p. 312) How does it play a part in and link the experiences of birth? Marriage? Torture? Death? Angels and martyrdom? And what is the significance of the presence of other colors: the purple of Alvaro’s hose? The red cloth that hangs in the confessional? The crimson of Marie Louise’s monthly flow and the blood lanced from her veins? 10. Carlos is portrayed as nauseatingly weak and ineffectual. How, then, is he able to so thoroughly destroy Marie Louise? How does his weakness motivate the people of Spain? His mother? His court? 11. What is the significance of the title Poison? The king s mother is responsible for murdering Marie Louise, but who else is responsible, metaphorically, for her poisoning? For Francisca’s? In what ways are the heroines of the novel considered poison by their society? 14. At the end of the book, Francisca says, “What do I believe? In nothing, and in everything.” (p. 312) How do the events of her life lead her to this paradoxical description of her faith? In her circumstances, wouldyou believe in “everything” or in “nothing”?